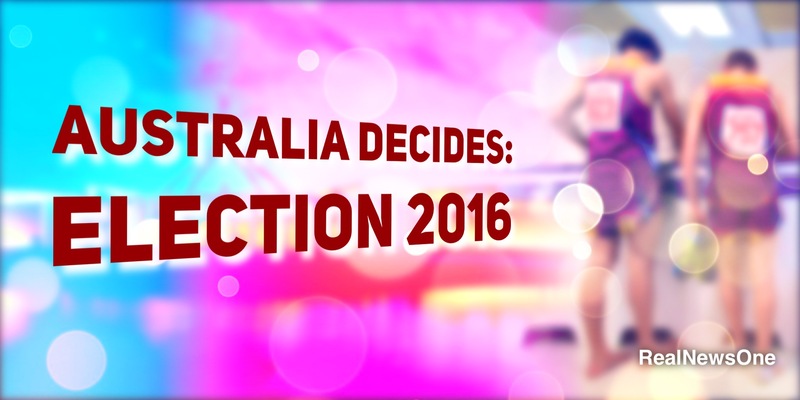 The 2016 election is formally underway, with Prime Minister Malcolm Turnbull going to Government House to obtain a double-dissolution poll on July 2. The election, flagged in March when Turnbull said he would take both houses to the people if the Senate refused to pass the government’s industrial relations legislation, will be preceded by an eight-week campaign. This will be the longest campaign since 1984. The double-dissolution election – the first since 1987 – is legally based on the Senate rejecting twice or more bills to re-establish the Australian Building and Construction Commission and to toughen trade union governance. The government and the opposition have been effectively in full campaign mode for weeks. The Coalition is placing its economic plan, outlined in last week’s budget, at the centre of its pitch, focusing on growth and jobs, with a commitment to phase down company tax over a decade. Labor’s pitch is posited on “fairness”, with substantial spending in its traditionally strong policy areas of education and health. But, substantially, the battle will be around leadership. Neither Turnbull nor Opposition Leader Bill Shorten have fought a campaign as leader before. The government and Labor go into the campaign neck and neck in recent opinion polls, although Turnbull – despite substantial falls in his ratings – retains a big edge on Shorten as preferred prime minister. A Galaxy poll in News Corp’s Sunday papers has a 50-50 dead heat in two-party terms. Post-redistribution, the government has a notional 89 seats in the House of Representatives. This includes Fairfax, which Palmer United Party leader Clive Palmer last week announced he will not re-contest. Labor has 57 seats. 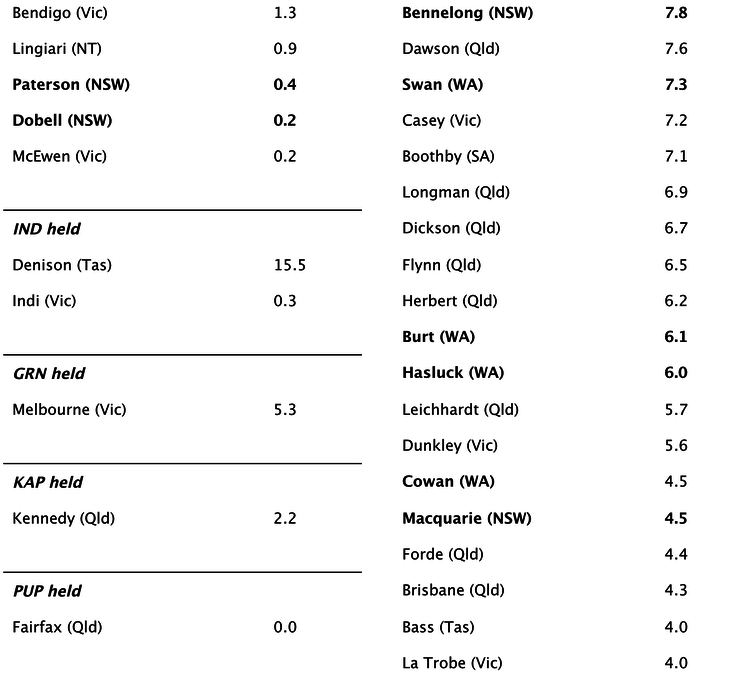 Excluding Fairfax, there are four seats in crossbench hands, one of them held by the Greens. On these numbers, Labor needs to win 19 seats (in net terms) to form majority government, which requires a 4% two-party uniform swing. The Coalition can lose up to 13 seats and still be in majority government. 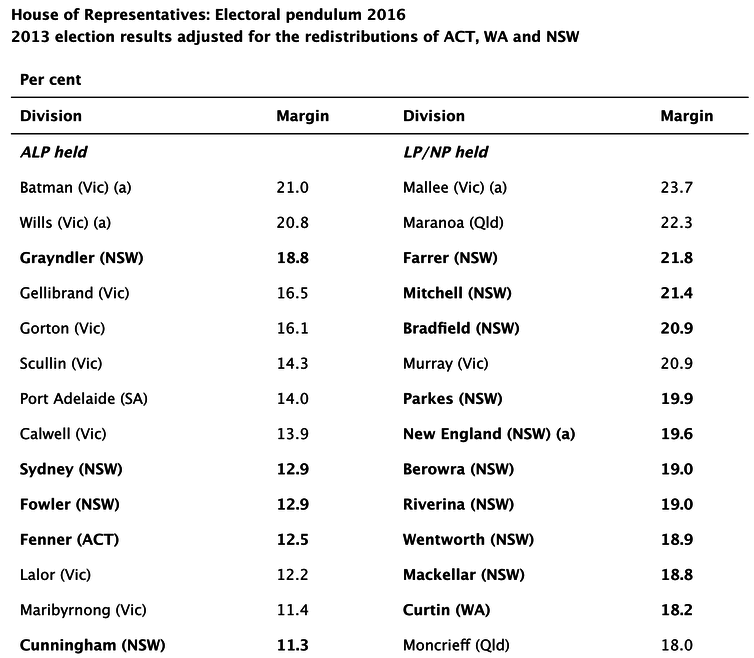 The most-marginal Coalition seats – under 2% – are Petrie (Qld) 0.5%; Capricornia (Qld) 0.8%; Lyons (Tas) 1.2%, Solomon (NT) 1.4%, Hindmarsh (SA) 1.9%. 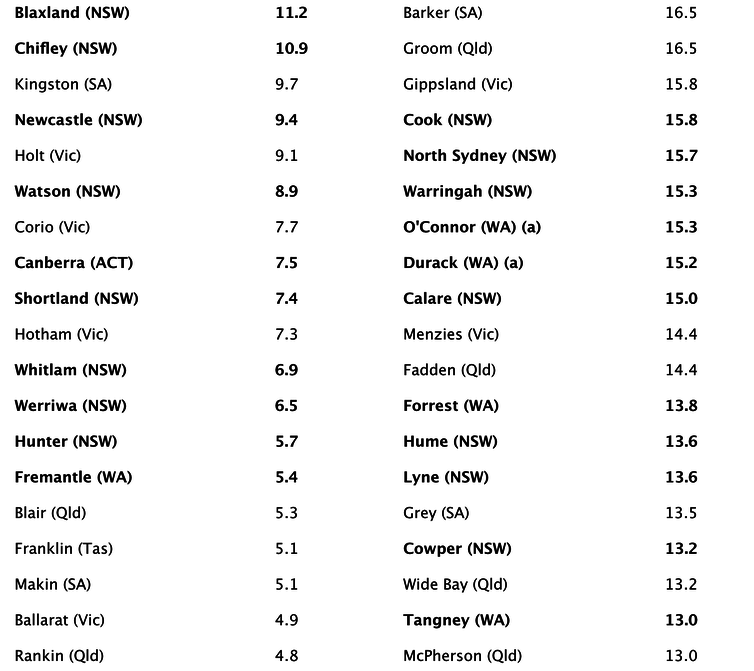 Labor has a lot more highly marginal seats: McEwen (Vic) 0.2%; Dobell (NSW) 0.2%; Paterson (NSW) 0.4%; Lingiari (NT) 0.9%; Bendigo (Vic) 1.3%; Parramatta (NSW) 1.3%; Lilley (Qld) 1.3%; Moreton (Qld) 1.6%; Richmond (NSW) 1.6%; Chisholm (Vic) 1.6%, and Bruce (Vic) 1.8%. 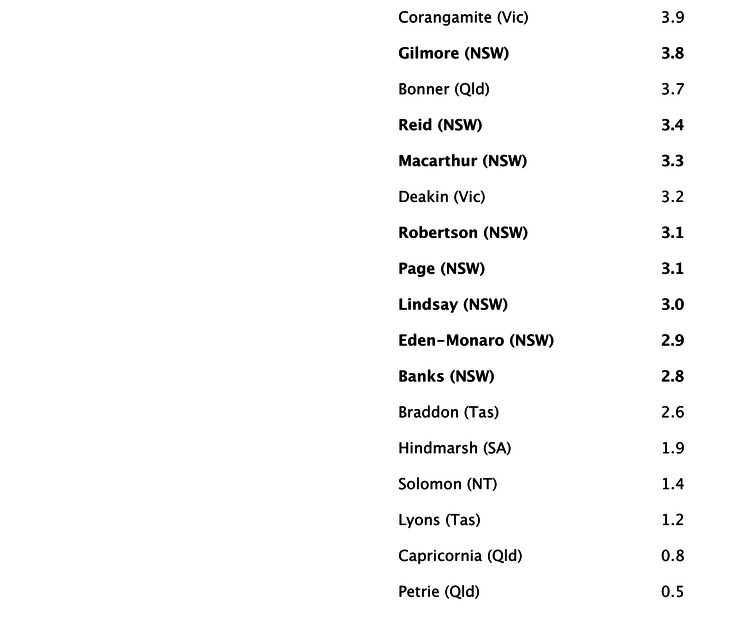 Dobell and Paterson have become notional Labor seats in the redistribution. While the Senate election will be held on the basis of recently passed voting changes that work against micro-players, the fact this is a double dissolution with its smaller quotas means a number of crossbenchers, apart from the Greens, are expected to be elected. The Coalition and opposition are expected to hit the commercial TV channels with advertising on Sunday night. Shorten was in Beaconsfield on Sunday afternoon to mark the tenth anniversary of the Beaconsfield rescue of two miners who had been trapped for a fortnight. National secretary of the Australian Workers Union at the time, Shorten had a high profile during rescue operation. Earlier on Sunday – Mother’s Day – Shorten said a Labor government would reverse the Coalition government’s cuts to paid parental leave, so that new mothers could claim leave under both the government scheme and their employment schemes. Labor says that if it is elected, each year 80,000 families with new babies would be as much as A$11,800 better off than they would be under a Coalition government. A year ago the Coalition condemned the dual claiming as double dipping. The government said it would clamp down on it, but legislation has not yet been passed. Labor says its promise will cost $1.4 billion over the forward estimates. 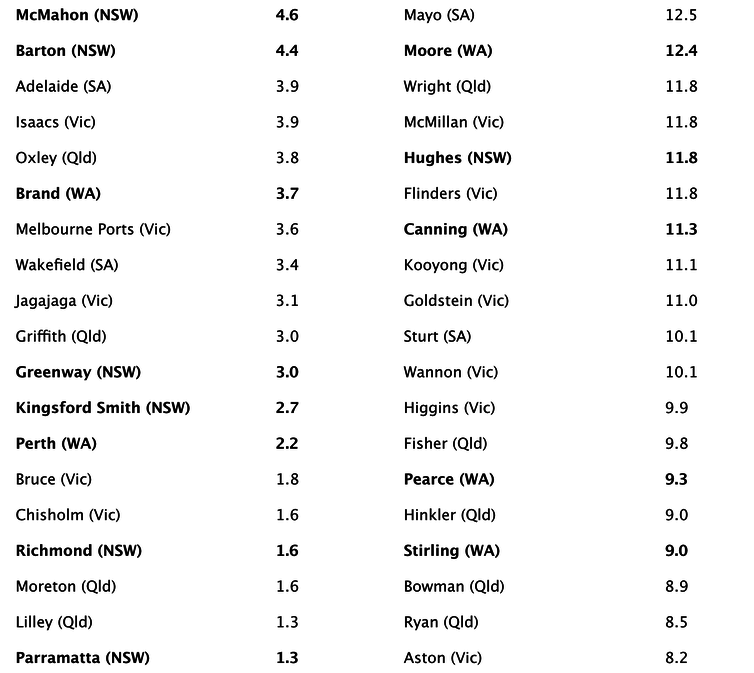 The estimated results for the redistributed divisions in ACT, WA and NSW are bolded.